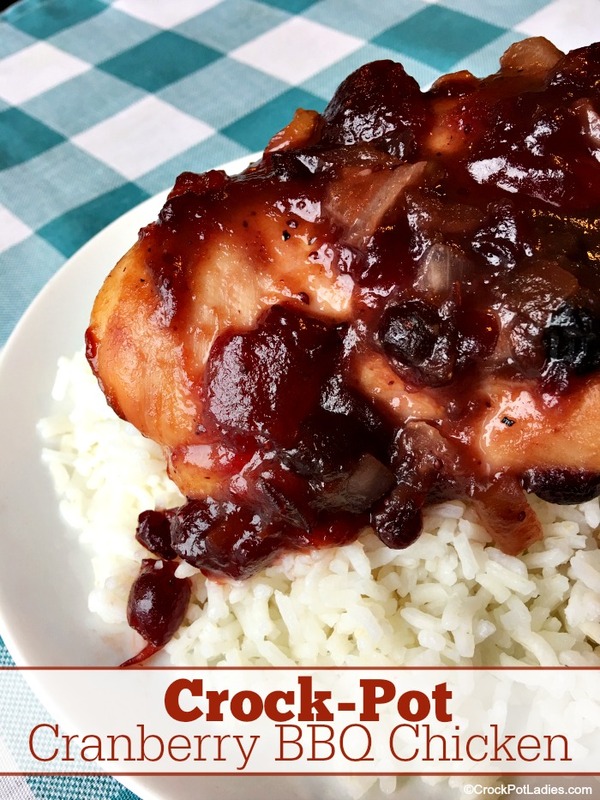 With only 4 simple ingredients this recipe for Crock-Pot Cranberry BBQ Chicken is perfect for dinner any night AND can also be made into a freezer meal! This time of year canned cranberry sauce is on sale at just about every grocery store in preparation for the holidays. 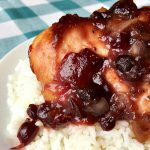 But I love cranberry sauce so much that I usually stock up on a few extra cans to use in recipes like this one for cranberry BBQ chicken. 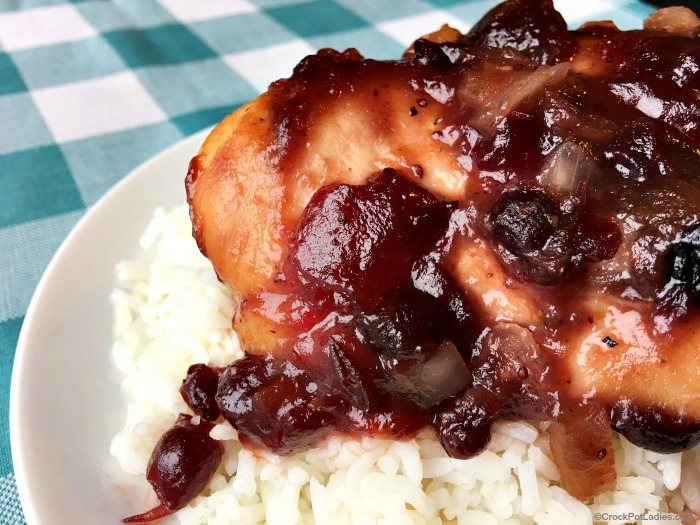 With just 4 ingredients this recipe is one of those “dump and go” recipes where you can cut up an onion and dump the rest of the ingredients (chicken, BBQ sauce and cranberry sauce) in the slow cooker and let it cook for a few hours. In fact, you can even prepare this recipe as a slow cooker freezer meal and have it ready to go to cook on busy days. When it is time to serve dinner cook up some white or brown rice and perhaps saute up some nice vegetables as a side dish and you have a easy dinner that everyone in the family will love. Just 4 ingredients are tossed in your slow cooker in this amazingly tasty chicken recipe. Add all ingredients to a 5 to 6 quart slow cooker and mix to coat the chicken in the cranberry and BBQ sauces. Cover and cook on LOW for 3 to 4 hours or until internal temperature of chicken registers 165° F on an instant read meat thermometer. Place all ingredients into a 1 gallon size zippered freezer bag OR FoodSaver bag. Place bag on flat surface and seal bag closed while pressing out as much excess air as possible OR use your FoodSaver sealing system to vacuum seal the bag closed. Label bag with date prepared, name of recipe, ingredients and cooking instructions. Lay bag flat in freezer and allow to freeze for several hours. At that point you can stand the bags upright in your freezer if desired. Place freezer meal in the refrigerator overnight OR in a clean kitchen sink filled with cool water just until the contents of the bag are partially thawed and can easily be removed from the bag and placed into your slow cooker. Cook partially frozen slow cooker meal on LOW for 4 to 5 hours. Are bone in breasts used in this recipe?? you can use bone in…but I used boneless. I am single (divorced & retired). I need a one quart Crock Pot and Recipes. Is there one available. You can find a 1.5 qt or 2 qt. Even a simple 3qt would suit your needs. This dish was fabulous! My kids are not turkey fans, so this will be a great alternative for me to prepare for them at Thanksgiving. Made this and it came out great, but the sauce was a little too watery. Any suggestions on how to remedy? Adding flour or cornstarch? I’m not no means a great cook and I’ve noticed this happens a lot with my slow cooker recipes. Thanks!!! Some brands of chicken have added water, some more than others so that water equates to a more runny sauce with some brands of chicken. You can thicken the sauce by adding a slurry of cornstarch and cold water. About 1 to 2 teaspoons cornstarch to 2 to 4 teaspoons of cold water. Add that into the sauce after cooking and let it cook for a little bit until the sauce thickens.